During their lifetimes, most adults are competent to make decisions about their finances and their healthcare. You tell the doctor whether or not you would like a procedure performed. You often direct the bank to transfer money to pay your bills all the time. Adults make these decisions so routinely but they often fail to consider what would happen if they are not able to make those decisions anymore. Through the normal course of life and also because of unfortunate tragedies, many people have a period of time where they are not capable of making their own decisions regarding their healthcare and their finances. The inability to make decisions regarding healthcare and finances is often called a “loss of competence” or a “loss of capacity”. The most common situation is the loss of competence due to the natural aging process. People are living longer and it is not uncommon for our minds to decline at advanced age. Legal competence may also be lost when a person suffers a tragic event such as serious illness or traumatic injury. For example, car accidents are a leading cause of death and a major cause of the loss of legal competence due to a temporary coma. Or a sudden cardiac event, while temporary, may create a situation in which a person is unable to make normal, everyday decisions. If a person becomes incompetent, somebody, usually a close relative, must file a petition in a probate court asking the court to appoint a “guardian” or a “conservator” of the disabled person. Some states use the term “guardian” while other states use the term “conservator”. Both terms refer to a person who is granted legal authority to make personal or financial decisions for another person. The petition for guardianship or conservatorship must be filed in the county in which the disabled person lives. The judge may appoint a “Guardian Ad Litem” to do an investigation and report on the disabled person. The Guardian Ad Litem’s investigation and the report is useful to the judge, who must decide whether guardianship is necessary. A physician’s report needs to be filed with the judge, as well. Then, during the court hearing, after reviewing all of the reports and documents and speaking with all of the parties, the judge will appoint a guardian on behalf of the disabled person. After he or she is appointed, the guardian must ask judicial permission to take certain actions and must also submit reports to the judge. Judges typically request annual reports, however, if the disabled person is living with a parent or other close family member, judges will sometimes seek reports every two years. 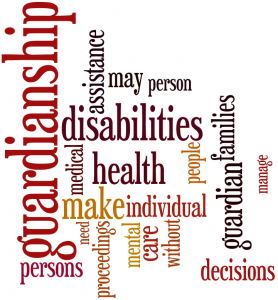 Guardianship may only be necessary for a temporary time period, especially after an accident or illness. If a disabled person recovers from his or her disability, he or she can ask the judge to be “reinstated.” Work with an experienced attorney such as the Guardianship Lawyer Chicago IL locals turn to. Thanks to authors at The Hays Firm for their insight into Guardianship Law.